No, we are not talking about makeup; we are referring to the enchanting designs of diamond nose pins, which are on display at Jewels Queen, and other reputed diamond jewelry store. It might interest you to know that this tradition has spread from the East to the West; many Western women are expressing an interest in beautifying the hitherto unadorned nose. · As mentioned earlier, Eastern women have their noses pierced for wearing a diamond jewelry. According to the Science of Ayurveda, the left side is considered a healthier spot; menstrual cycles are less painful and childbirth becomes easier. · Hippies, who visited India during the 1990s, found this kind of adornment, highly fascinating. By the end of the next decade, it became a rage amongst fans of the ‘Punk Movement.’ However, even at that time, it merely represented a rebel movement. People, who hated the conservative mindset, wore it as a symbol of the liberal mindset. 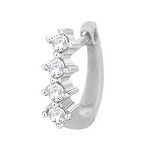 · Gradually, as women began to discover that nose piercing could be a painless procedure, they also began to appreciate this simple ornament as a marvelous jeweled accessory. Thus, you can find innovative manufacturers experimenting with the designs of diamond nose pins across the U.S., UK, Australia, Canada and Europe. · Talented professionals do bear in mind that the nose is in the center of the face, and not very big in proportions. Naturally, they avoid coming up with diamond nose stud designs that seem highly disproportionate and ugly, thereby ruining the entire look of the face. Furthermore, your delicate organ does not wish to be burdened with heavy items. 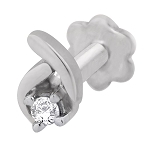 · Over the years, it has become fashionable to sport all kinds of contemporary and traditional single diamond nose stud at casual parties and formal events. Studs and hooks are suitable for those, who have had their noses pierced. Of course, the elegance, sophistication, chic, or gracefulness of the chosen adornment will vary from occasion to occasion. · At Jewels Queen’s, you will find exquisite pieces with intricate details that should appeal to everyone’s tastes. Crafted from 14K white gold or 14K yellow gold, the diamond nose pins are available in wire style or screw back. Single diamond nose pin designs in yellow or white gold have solitaires ranging from 5 cents to 40 cents. The small and big, round-cut diamonds are superbly highlighted via the prong setting. Naturally, your nose emanates a scintillating radiance that serves to attract immediate attention from onlookers. 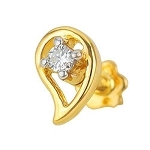 · If you are on the lookout for non-conventional solitaire diamond nose ring, you may go in for stars, hearts, geometric designs, or floral creations hanging from the end of your nose. 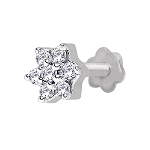 Floral designs nose pins with 3, 5, or 7 diamonds are particularly popular with 7 stone being the most liked. Do not hesitate to make a fashion statement wherever you go. · On the other hand, if you are on the lookout for traditional-looking pieces, you may opt for simple studs sporting a lone solitaire or nose rings mounted with several precious stones like sapphire, ruby or emerald. Yes, in simplicity, often lies the greatest beauty! In fact, they are perfectly suitable for extremely formal affairs. You need not worry about price, for you will be able to obtain high quality nose adornments at Queen’s even at a lowly price of less than hundred dollars. Satisfaction is guaranteed!